In today’s fast-paced world it seems like more than ever we are becoming conscious of what we need to do when it comes to our health. But so often it’s the case that we get stuck on the battle between making health a priority, and making it cost and time effective. 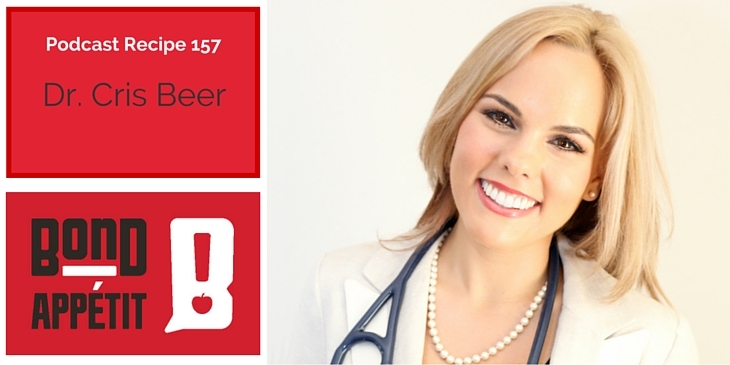 Enter in this week’s guest on Brisbane, Australia native, Ronsley Vaz’s top-rated iTunes food-related podcast, medical doctor and nutritionist, Cris Beer. Cris Beer has all the training, expertise, and knowledge to understand how to propel Aussies and eaters of all nationalities around the globe into better health. Chef, Ronsley Vaz, a mastermind chef for high-level entrepreneurs decided to answer his podcast listener’s questions during a Q+A session. While the answers are a bit long—too long to spell out in their entirety, they center on a few key themes that I think we all can relate to when it comes to managing our wallets and waistlines. How Do I Make a Healthy Meal in Half of the Time? Dr. Cris: I try to keep things simple. Sometimes it calls for a reeducation of the taste buds. Keeping things quick and easy might sound boring, but for instance a really quick lunch for me is a prewashed bag of greens or salad, and I just add a can of tuna and maybe some sesame oil, and that took me about four-and-a-half minutes to prepare. It’s kind of like you just have to be planned and prepared and know what you are going to make ahead of time. Would you agree, Ronsley, that healthy, fast food, doesn’t take that long to actually prepare? Ronsley: Absolutely and I think one of the big ones is to be prepared ahead of time, and you can actually get it done in fifteen minutes. And it’s very simple if you have a list of things that you can make like chicken at the bottom of the fridge—which lasts for about 3-4 days—so be mindful of something like that—if it’s cubed, switch the frying pan on and dump some veggies in there and it won’t take more than 7 or 8 minutes to get that together. You can use, what Cris suggested sesame or a side of oil and you’re done, pretty much. How Do I Get Healthy Food When Traveling? Dr. Cris: So I guess to go back to what do I do, I try to stick to things that are fresh, salads, vegetable-based. I avoid creamy soups, creamy sauces—things that are too decadent. If you are going out and enjoying it with friends and family—enjoy your own holidays. I suggest soups, they’re easy, fast, and you get a lot of nutrition out of them. How Do I Stay Fuller, Longer? Dr. Cris: Good question. So I’ve noticed that when I use to eat a lot of processed sugar, there was a time in my life, and I ate a lot of fast food that my appetite was different. Now, I can go a lot longer without eating food before I feel like I want to kill somebody. I don’t get ravenous anymore; it goes about six, seven, eight hours before I get ravenous. I’m surprised at that. Give me a green tea and a glass of water and I’m sort of good for a few hours. Ronsley: No, I absolutely agree. And I was going to say it’s probably because you were hydrated. And that’s one of the key ones, if you aren’t hydrated that’s sometimes when we feel hungry, but we are actually thirsty. Dr. Cris: That’s a good point. Ronsley: One of my recent suggestions to my clients, if you are working and forget to eat, and are hungry-“hangry”—and you need to make a decision about food, find the biggest glass of water you can find and drink the water, and then make the decision after you’ve had the water. I mean you don’t have to have it right all the time, but chances are you are going to get it right at least 80% of the time. How Do I Deal With Temptation To Splurge? Dr. Cris: I think don’t rely on willpower—willpower will fail you. Do not blame yourself. You are not weak. Even the strongest ones out there have moments of temptation. It happens to all of us. I have met Olympic athletes prime of their training capacity and they are self-disciplined and they still ask this question. Do not rely on discipline. Willpower is actually only meant to sustain us short-term. Life really is a marathon and so are health goals. So really what you have to look at is removing temptation. If you are tempted in other sorts of situations, the other thing to do is to create so many good habits in your life that you aren’t worried about the bad habits. So that you think that about 80% of your lifestyle is congruent healthy habits that are consistent with where you want to see yourself in the future. Ronsley: You’re right. I think temptation is such a big one. Like you said, if you land up eating a small piece of the big chocolate somehow the brain tells you you’ve already eaten one piece, you might as well eat another one. And so you get to a point where you say I’m going to finish the bar today so I don’t have the temptation tomorrow. Ronsley: We all make bad decisions when we are tired or stressed. Wait…Free-Range? Organic? Grass-fed? Hormone Free? What’s All The Beef About? Dr. Cris: Hormone free, means not giving growth-promoting hormones. Traditionally, whenever I go to conferences about healthy eating what you are told is: for chicken get free-range hormone-free, organic, if you can afford it. When you are talking about beef, hormone-free, grass-fed is the general standard. Ronsley: Well, the definition of free-range is that the animal should travel 250 meters every four hours to be classified as free-range. Dr. Cris: So I guess my best suggestion is if you can get it from the butcher, you can have a dialogue with the butcher about what you are eating. I do the same thing with fish. I buy my fish from the fishmonger, so I can say where was this caught, is it fresh, that sort of thing. But with chicken, it’s best to go hormone-free. If you can afford it for beef, go organic. But otherwise, go organic free-range, grass-fed. How Do I Get Excited About Cooking? Ronsley: So one of the things is experience. I see this a lot—an all or nothing approach. We think that we are going to start cooking and we buy food for the whole week. And in the previous week if you haven’t cooked seven meals, then you aren’t going to do that in the following week. Start with one. Do everything normally and that will give you enough experience, and your brain will sort of fire on different cylinders of taste and physical senses will activate. And if you feel up to it, next week up it to two. Don’t do it all too quickly. It’s like with cooking, it’s just dumb. With cooking I suppose it’s the same thing. Once you taste different flavors 8 your taste buds go from black-in-white to full HD. You know what to ingredients to go with and still make it like a different dish and it will still blow your senses. I suppose it’s one step at a time—I know not the most inspiring answer. Trust me, if you are doing something you’ve been doing for a while to change that habit it does take a bit of initial inertia. How Do I Stop The Habit of Mindless Eating? Ronsley: Definitely, don’t eat and do something else. That’s the biggest thing. And also having the nuts and all the other snacks next to your computer table. Have a massive bottle of water, or green tea as you suggested—just having that will reduce your hunger pangs, drastically. You are probably thirstier than you are hungry. Cris: I have a rule that there is no food in my computer room, in my study, or on the couch. So food exists only on the dining table, and the breakfast bar.